NOTE: All accessories are brand new in package and have never been used, unless otherwise noted. Additional charges may apply (s/h, tax). This accordion-syle album features white paper-covered chipboard covers with six pages inside. This is a current CTMH product. This accordion-style album features white paper-covered chipboard covers with six pages inside. Exclusive Ink® stamp pad with an innovative in-lid pad to keep ink close to the surface. Labeled on three sides for quick reference. Pad is stackable, closes securely, and features a patented swivel base for easy access to the entire pad surface. Approx. 3 1/8" × 4" and contains dye-based or pigment-based ink that is vivid, luxurious, and true in color. It’s also archival safe and pH-neutral. Refresh a used stamp pad with a matching re-inker. Exclusive Inks® stamp pad with an innovative in-lid pad to keep ink close to the surface. Labeled on three sides for quick reference. It is stackable, closes securely, and features a patented swivel base for easy access to the entire pad surface. Approx. 3 1/8" × 4" and contains dye-based or pigment-based ink that is vivid, luxurious, and true in color. It’s also archival safe and pH-neutral. Refresh a used stamp pad with a matching re-inker. 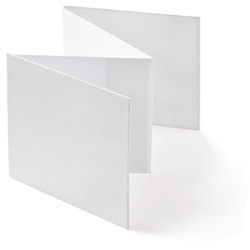 Package of 50 cards and envelopes - 4 1/4" x 5 1/2"
8 flexible, clear cards including 4 square and 4 scalloped circles. Remove clear protective cover before use. 8 cello envelopes included. 8 rectangle cards with either rounded corners or a bracket edge. Includes 8 cello envelopes. Remove clear protective film before use. Keep glitter, eyelets, brads, and other small objects neatly contained while working with these small accessories. Tray mouth works as a funnel when returning items to their containers. Flip Flap Memory Protectors - 4" x 6"
Easily add extra photos to your scrapbook page with Flip Flaps™. Slide your photo or journaling into the pocket, attach with the adhesive strip, and you're done! Use Flip Flaps to create a cute mini album. (15 – 4" × 6" protectors with adhesive attachment strip). Cardstock Spots are perfect for adding pretty journaling to layouts. 24 Spots in several shapes and sizes. Colors include: Blush, Chocolate, Colonial White, Cranberry, Vanilla Cream, White Daisy. These 10 chipboard doors and windows can be stamped, chalked, painted, papered, and more. Perfect for embellishing the My Creations™ Board Book. (sizes from 1 1/2" to 6"). Create a single-event album or spotlight a favorite person with this handy chipboard mini album with unique die-cut pages. (6 chipboard pages, 5 page designs, 6 1/4" x 7"). This trendy banner includes 8 white chipboard pennants with 7 jump rings. Pennants are 7" x 6". Chipboard album can stand to display photos or layouts or be used as a book. Get creative and use it as a desktop monthly calendar, a photo flip frame, and more! (Includes chipboard covers with 12 spiral-bound 6" × 6" page protectors). Create a beautiful journal all your own, then write the night away! (7" x 5" clear pocket on front cover; 75 unlined pages).